We all have stress in our lives, both good and bad. Our bodies were built to deal with and respond to stress. So why are practitioners in pretty much every field talking about stress management and things like meditation, tapping (emotional freedom technique), and self care? Because our society has evolved quickly with technology and created a stressful environment that our bodies cannot adapt to. Instead of having your typical stressor of trying to get food or being chased by a bear we are now constantly bombarded with stressors all day long. What is stress? It is a normal reaction that switches our body from a relaxed state, to a state of alertness and gives us the ability to react quickly whether the stressor calls for it or not. This means that sitting in traffic is a stressor, getting in a fight with a loved one, even feelings of anxiety or depression. The way we are constantly stimulated and turned on with our phones, email, work, and social media are stressors. We also have hidden stressors that you may not see or feel, but that elicit the same stress response. How we perceive and handle stress also has an impact on the stress response and can improve or worsen it. This means that if you have a stressor in your life that you can’t get rid of like an unfulfilling job, you can change your perspective on how you look at this stressor to reduce the overall stress response. This is a huge reason why meditation is helpful for dealing with stress since it can help shift our perspective. Take a look at all of the different types of stressors below. Make note of which apply to you. What happens inside your body during stressful a stressful event/thought/or hidden stressor? The hypothalamus, a small gland that controls a lot of your body, alerts your pituitary gland, which then alerts your adrenals to release the hormones cortisol, DHEA, as well as epinephrine and norepinephrine. This is important to recognize because stress doesn’t just impact the adrenals, but also your hypothalamus and pituitary, which is why I avoid using the term adrenal fatigue. I prefer to refer to it as hypothalamus-pituitary-adrenal axis dysfunction or adaptation since your body is trying to adapt to it’s stressful surroundings. It’s good to have some stress in your life, but overtime, chronic stress breaks down the body, causes irritation to the gut, hormonal imbalances, detox disturbances, nutrient deficiencies and more. Another way to support a healthy stress response in our fast paced world is to use adaptogens. -Superfood Evolution, See the whole video below. Certain adaptogens should only be taken if you’ve had your hormones tested (licorice root and ashwaghanda) since they can actually increase or lower your cortisol levels. This shows how powerful adaptogens can be. I particularly like using and recommending different types of mushrooms to support a healthy stress response since they work for most people and don’t have harmful side effects. You also don’t need to have your hormones tested prior to using. Anyone can really benefit from them. Reishi: This mushroom not only has powerful anti-cancer property, improves liver function and detoxification, but also support anxiety and stress. Traditional Chinese medicine uses reishi to treat insomnia. It’ a great mushroom to take when stressed or before bed. I take the reishi elixir highlighted below at night with tea or have the reishi hot cocoa. Lion’s Mane: This is the only mushroom that has two nerve-growth factors, which is what makes it so powerful for the brain. It’s shown potential benefits for those with Alzheimer’s and Parkinson’s disease. Lion’s Mane is one of the most beneficial mushrooms to take for your brain as it been shown to support memory, concentration, attention, and creativeness. Research has also shown that it’s helpful for cramps, MS, and anxiety. I use the Lion’s Mane elixir from Four Sigmatic and mix into organic decaf coffee in the mornings or tea in the afternoons. Cordyceps: This mushroom is great for those looking for a boost of energy without the jitters or slump later in the day that coffee can give you. These mushrooms can support respiratory health and oxygen uptake (that’s where the energy boost comes from), as well as support detoxification in the body. Cordyceps are also anti-cancer like many other adaptogenic mushrooms. I take these before I workout and on days when I know I need the energy. I use the Cordyceps elixir from Four Sigmatic and mix into organic decaf coffee in the mornings or tea in the afternoons. Chaga: This mushroom is especially great for immune health. It also contains polysaccharides, which help provide energy and improve and maintain heart, liver, and gut health. They are very high in antioxidants, much like other mushrooms, but actually contain even more than green tea. Chaga mushrooms are great for supporting physical and mental stressors and help to balance the nervous system. I use the Chaga elixir from Four Sigmatic and mix into organic decaf coffee in the mornings or tea in the afternoons. My favorite brand to use is below! They have the best extraction process and quality products. 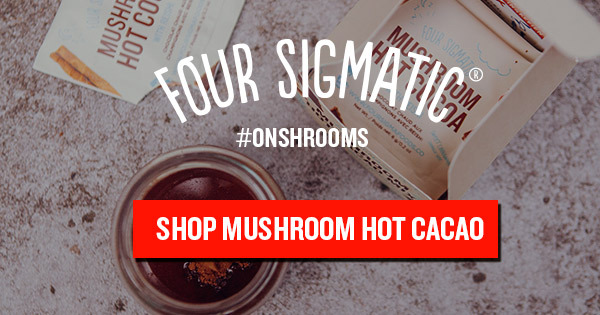 Why Four Sigmatic Mushroom Products? Easy to use: Just add to hot water, coffee, tea, or a smoothie or recipe of your choice. Effective: 500-1500mg of Dual Extracted mushrooms per serving. The most potent product on the market. One packet = 10-15 capsules. High quality ingredients: Wildcrafted or Log Grown and certified organic mushrooms (3-6 ingredients added with supporting benefits. Tested for pesticides, heavy metals, irradiation, mycotoxins, pesticides and other factors. Click here for more information on their quality. What do you think? Have I convinced you to try mushrooms yet? Comment below and let me know! 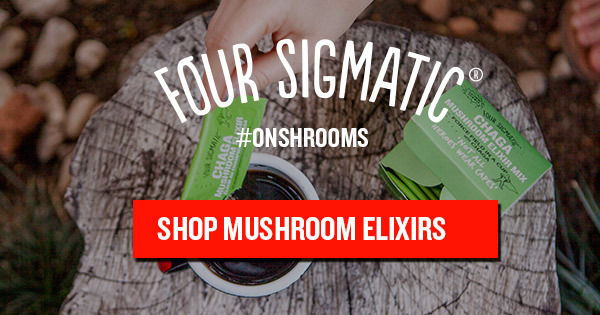 Also, if you plan to purchase from Four Sigmatic you can use the code YNTL to get 10% off your order.